On January 24 2018 Pope Francis spoke of the Contemplative life as: "A real 'lung' of faith and prayer for the Church and the whole of society." It is Christ himself who invites us to be “merciful, even as your Father is merciful” (Lk 6:36); and you are privileged witnesses of this “as”, of this “way” of God’s merciful action. In fact, if it is only in the contemplation of Jesus Christ that we find the face of the Father’s mercy (cf. Bull of Indiction Misericordiae Vultus, 1), the monastic life constitutes a royal road for this contemplative experience and translates it into personal and communitary witness. The world today demonstrates ever more clearly the need for mercy; but this is neither a slogan nor a recipe: it is the heart of the Christian life and at the same time its practical way, the breath that enlivens interpersonal relationships and makes us attentive to the most needy, in solidarity with them. This is what ultimately manifests the authenticity and credibility of the message of which the Church is the depositary and herald. In this time and in this Church that is called to point more and more to what is essential, monastic men and women maintain by their vocation, a special gift and a special responsibility: that of keeping the oasis of the spirit alive, where pastors and faithful can draw from the springs of divine mercy. For this reason, in the recent Apostolic Constitution Vultum Dei Quaerere, I address contemplative women, and by extension all monks: “The ‘ora et labora’ of the Benedictine tradition should always be your inspiration and help you to find the right balance between seeking the Absolute and commitment to your daily chores, between the peace of contemplation and the effort expended in work” (n. 32). Seeking, with the grace of God, to live mercifully in your communities, you proclaim the fraternity of the Gospel in all of your monasteries, scattered throughout every corner of the planet; and you do so through silent and eloquent work that allows God to speak within the loud and distracted life of the world. The silence that you observe and of which you are custodians is the necessary “prerequisite to that gaze of faith that enables us to welcome God’s presence into our own life, that of the brothers and sisters given us by the Lord, and the events of today’s world” (ibid., 33). Even if you live apart from the world, your enclosure is not barren, but rather, it is “an enrichment and not an obstacle to communion” (ibid., 31). Your work, in harmony with prayer, enables you to participate in the creative work of God and shows “your solidarity with the poor who cannot live without work” (ibid., 32). With your customary hospitality, you are able to encounter the hearts of those who are most lost and distant, of those who are in conditions of severe human and spiritual poverty. ... Your contemplative life is also a privileged channel for nourishing communion with the brothers and sisters of the Eastern Churches. …Do not be discouraged if the members of monastic communities decrease in number or grow old; on the contrary, preserve the zeal of your testimony, even in those countries which today face difficulties, with fidelity to the charism and the courage to establish new communities. Your service to the Church is very precious. Even in our time there is a need for men and women who place nothing before the love of Christ (cf. The Rule of St Benedict, 4:21; 72:11), who nourish themselves daily with the Word of God, who worthily celebrate the holy liturgy, and who joyfully and diligently work in harmony with creation. 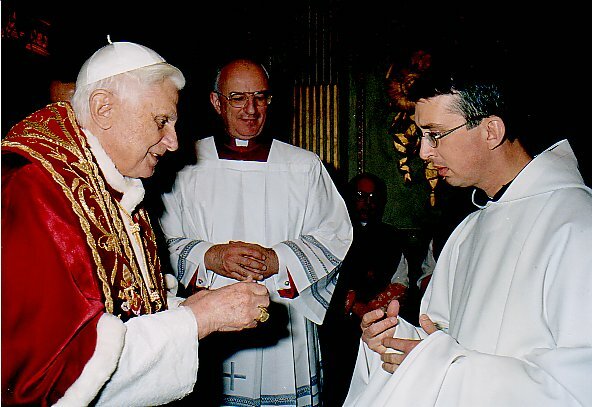 On the Feast of Saint Agnes, January 21st, 2006, Pope Benedict XVI blesses the lambs for the pallium presented by three Cistercian monks, Dom Giacomo, Abbot of Tre Fontane, in Rome, Fra Ludovico of Tre Fontane, and Father Graham of Our Lady of Calvary. “Some might think that it would suffice to come here to take this "leap." But it is not like this. This vocation, like every vocation, finds an answer in an ongoing process, in the searching of a whole life. Indeed it is not enough to withdraw to a place such as this in order to learn to be in God's presence. Just as in marriage it is not enough to celebrate the Sacrament to become effectively one but it is necessary to let God's grace act and to walk together through the daily routine of conjugal life, so becoming monks requires time, practice and patience, "in a divine and persevering vigilance," as St Bruno said, they "await the return of their Lord so that they might be able to open the door for him as soon as he knocks" (Letter to Rudolph "the Green", n. 4); and the beauty of every vocation in the Church consists precisely in this: giving God time to act with his Spirit and to one's own humanity to form itself, to grow in that special state of life according to the measure of the maturity of Christ. In Christ there is everything, fullness; we need time to make one of the dimensions of his mystery our own. We could say that this is a journey of transformation in which the mystery of Christ's resurrection is brought about and made manifest in us, a mystery which the word of God in the biblical Reading from the Letter to the Romans has recalled to us this evening: the Holy Spirit who raised Jesus from the dead and will give life even to our mortal bodies (cf. Rom 8:11) is the One who also brings about our configuration to Christ in accordance with each one's vocation, a journey that unwinds from the baptismal font to death, a passing on to the Father's house. In the world's eyes it sometimes seems impossible to spend one's whole life in a monastery but in fact a whole life barely suffices to enter into this union with God, into this essential and profound Reality which is Jesus Christ. I have come here for this reason, dear Brothers who make up the Carthusian Community of Serra San Bruno! To tell you that the Church needs you and that you need the Church. Your place is not on the fringes: no vocation in the People of God is on the fringes. We are one body, in which every member is important and has the same dignity, and is inseparable from the whole. You too, who live in voluntary isolation, are in the heart of the Church and make the pure blood of contemplation and of the love of God course through her veins. St Benedict's life was steeped in an atmosphere of prayer, the foundation of his existence. Without prayer there is no experience of God. Yet Benedict's spirituality was not an interiority removed from reality. In the anxiety and confusion of his day, he lived under God's gaze and in this very way never lost sight of the duties of daily life and of man with his practical needs. Seeing God, he understood the reality of man and his mission. In his Rule he describes monastic life as "a school for the service of the Lord" (Prol. 45) and advises his monks, "let nothing be preferred to the Work of God" [that is, the Divine Office or the Liturgy of the Hours] (43, 3). However, Benedict states that in the first place prayer is an act of listening (Prol. 9-11), which must then be expressed in action. "The Lord is waiting every day for us to respond to his holy admonitions by our deeds" (Prol. 35). Thus, the monk's life becomes a fruitful symbiosis between action and contemplation, "so that God may be glorified in all things" (57, 9). In contrast with a facile and egocentric self-fulfilment, today often exalted, the first and indispensable commitment of a disciple of St Benedict is the sincere search for God (58, 7) on the path mapped out by the humble and obedient Christ (5, 13), whose love he must put before all else (4, 21; 72, 11), and in this way, in the service of the other, he becomes a man of service and peace. In the exercise of obedience practised by faith inspired by love (5, 2), the monk achieves humility (5, 1), to which the Rule dedicates an entire chapter (7). In this way, man conforms ever more to Christ and attains true self-fulfilment as a creature in the image and likeness of God. The obedience of the disciple must correspond with the wisdom of the Abbot who, in the monastery, "is believed to hold the place of Christ" (2, 2; 63, 13). The figure of the Abbot, which is described above all in Chapter II of the Rule with a profile of spiritual beauty and demanding commitment, can be considered a self-portrait of Benedict, since, as St Gregory the Great wrote, "the holy man could not teach otherwise than as he himself lived" (cf. Dialogues II, 36). The Abbot must be at the same time a tender father and a strict teacher (cf. 2, 24), a true educator. Inflexible against vices, he is nevertheless called above all to imitate the tenderness of the Good Shepherd (27, 8), to "serve rather than to rule" (64, 8) in order "to show them all what is good and holy by his deeds more than by his words" and "illustrate the divine precepts by his example" (2, 12). To be able to decide responsibly, the Abbot must also be a person who listens to "the brethren's views" (3, 2), because "the Lord often reveals to the youngest what is best" (3, 3). This provision makes a Rule written almost 15 centuries ago surprisingly modern! A man with public responsibility even in small circles must always be a man who can listen and learn from what he hears. Benedict describes the Rule he wrote as "minimal, just an initial outline" (cf. 73, 8); in fact, however, he offers useful guidelines not only for monks but for all who seek guidance on their journey toward God. For its moderation, humanity and sober discernment between the essential and the secondary in spiritual life, his Rule has retained its illuminating power even to today. (General Audience of Wednesday 9 April, 2008). On 15 September 2007, feast of Our Lady of Calvary, Pope Benedict XVI received the Poor Clares of Castelgandolfo in audience. Here are one or two of his remarks, repeating what Paul VI and John Paul II had said to them. "In particular I recall what the servant of God Paul VI said to you: that in the face of those who consider cloistered people as out of touch with reality and the experience of our time, your existence has the value of a special witness which intimately affects the Church's life. 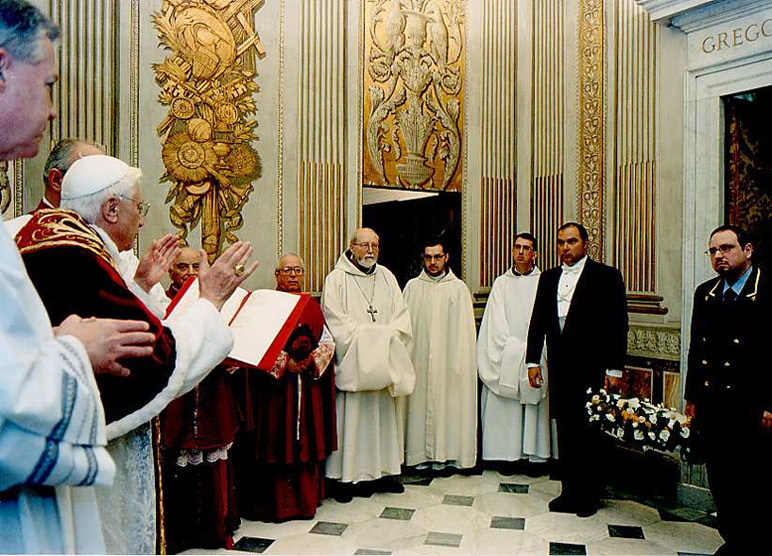 John Paul II desired to entrust himself, the Church and the whole of humanity to your prayers. "You have not left the world", he observed, "because you did not want to bear the crosses of the world...you carry them all in your heart, and in the troubled scenario of history you accompany humanity with your prayer... Because of this presence of yours, hidden but authentic within society and even more so within the Church, I also look with confidence to your joined hands." So this is what the Pope expects of you: that you be bright torches of love, "joined hands", watching in ceaseless prayer, totally detached from the world, in order to sustain the ministry of the One whom Jesus has called to guide his Church." "Non lontano da Vienna si trova l'Abbazia di Heiligenkreuz... Rivolgendomi ai monaci, ho richiamato... il valore della preghiera come servizio di lode e di adorazione dovuto a Dio" - Pope Benedict at the General Audience 12 September 2007. On 9 September 2007 Pope Benedict XVI visited the Cistercian Monastery of Heiligenkreutz in Austria. Here are some extracts from what he said there about monastic and Cistercian life. “On my pilgrimage to the Magna Mater Austriae, I am pleased to visit this Abbey of Heiligenkreuz, which is not only an important stop on the Via Sacra leading to Mariazell, but the oldest continuously active Cistercian monastery in the world. I wished to come to this place so rich in history in order to draw attention to the fundamental directive of Saint Benedict, according to whose Rule Cistercians also live. Quite simply, Benedict insisted that “nothing be put before the divine Office”. For this reason, in a monastery of Benedictine spirit, the praise of God, which the monks sing as a solemn choral prayer, always has priority. Monks are certainly – thank God! – not the only people who pray; others also pray: children, the young and the old, men and women, the married and the single – all Christians pray, or at least, they should! In the life of monks, however, prayer takes on a particular importance: it is the heart of their calling. Their vocation is to be men of prayer. In the patristic period the monastic life was likened to the life of the angels. It was considered the essential mark of the angels that they are worshippers. Their very life is worship. This should hold true also for monks. Monks pray first and foremost not for any specific intention, but simply because God is worthy of being praised. “Confitemini Domino, quoniam bonus! – Praise the Lord, for he is good, for his mercy is eternal!”: so we are urged by a number of Psalms (e.g. Ps 106:1). Such prayer for its own sake, intended as pure divine service, is rightly called officium. It is “service” par excellence, the “sacred service” of monks. It is offered to the triune God who, above all else, is worthy “to receive glory, honour and power” (Rev 4:11), because he wondrously created the world and even more wondrously renewed it. “Austria (Österreich) is, in an old play on words, truly Klösterreich: a realm of monasteries and a land rich in monasteries. Your ancient abbeys whose origins and traditions date back many centuries are places where “God is put first”. Dear friends, make this priority given to God very apparent to people! As a spiritual oasis, a monastery reminds today’s world of the most important, and indeed, in the end, the only decisive thing: that there is an ultimate reason why life is worth living: God and his unfathomable love. “Saint Leopold of Austria – as we heard earlier - on the advice of his son, Blessed Otto of Freising, who was my predecessor in the episcopal see of Freising (his feast is celebrated today in Freising), founded your abbey in 1133, and called it Unsere Liebe Frau zum Heiligen Kreuz – Our Lady of Holy Cross. This monastery is dedicated to Our Lady not simply by tradition – like every Cistercian monastery –, but among you there burns the Marian flame of a Saint Bernard of Clairvaux. Bernard, who entered the monastery along with thirty of his companions, is a kind of patron saint of vocations. Perhaps it was because of his particular devotion to Our Lady that he exercised such a compelling and infectious influence on his many young contemporaries called by God. Where Mary is, there is the archetype of total self-giving and Christian discipleship. Where Mary is, there is the pentecostal breath of the Holy Spirit; there is new beginning and authentic renewal. From this Marian sanctuary on the Via Sacra, I pray that all Austria’s shrines will experience fruitfulness and further growth. Here, as at Mariazell, I would like, before leaving, to ask the Mother of God once more to intercede for all of Austria. In the words of Saint Bernard, I invite everyone to become a trusting child before Mary, even as the Son of God did. Saint Bernard says, and we say with him: “Look to the star of the sea, call upon Mary … in danger, in distress, in doubt, think of Mary, call upon Mary. May her name never be far from your lips, or far from your heart … If you follow her, you will not stray; if you pray to her, you will not despair; if you turn your thoughts to her, you will not err. If she holds you, you will not fall; if she protects you, you need not fear; if she is your guide, you will not tire; if she is gracious to you, you will surely reach your destination”. At the Angelus on Sunday 19 November 2006, the Holy Father, Pope Benedict XVI spoke as follows. The day after tomorrow, November 21, on the occasion of the liturgical memorial of the Presentation of Mary Most Holy in the Temple, we celebrate "pro Orantibus" Day, dedicated to remembering cloistered religious communities. It is a particularly appropriate occasion to thank the Lord for the gift of so many persons who, in monasteries and hermitages, are totally dedicated to God in prayer, silence and hiddenness. Some wonder about the meaning and value of their presence in our time, in which many urgent situations of poverty and need must be addressed. Why "shut oneself" forever behind the walls of a monastery and deprive others of the contribution of one's talents and experiences? What efficacy can prayer have to resolve the numerous concrete problems that continue to afflict humanity? In fact, also today numerous persons often surprise friends and acquaintances when they abandon professional careers, often promising careers, to embrace the austere rule of a cloistered monastery. What leads them to take such a committed step if not their having understood, as the Gospel teaches, that the Kingdom of heaven is "a treasure" for which it is worth abandoning everything (cf. Matthew 13:44)? These brothers and sisters silently witness that in the midst of daily vicissitudes, at times extremely convulsive, God is the only support that never falters, the unbreakable rock of fidelity and love. "Todo se pasa, Dios no se muda" [Everything passes, God is unchanging], wrote the great spiritual teacher Teresa of Avila in her famous text. And, given the widespread need that many experience to leave the daily routine of the great urban agglomerations in search of appropriate spaces for silence and meditation, monasteries of contemplative life appear as "oases" in which man, a pilgrim on earth, can go to the sources of the Spirit and slake his thirst along the way. These places, apparently useless, are, on the contrary, indispensable, like the green "lungs" of a city: They are beneficial for all, including for those who do not visit them or perhaps do not know that they exist. Dear brothers and sisters: Let us thank the Lord, who in his providence, has willed that there be cloistered communities, masculine and feminine. May they not lack our spiritual and also material support so that they will be able to fulfill their mission of keeping alive in the Church the ardent expectation of Christ's return.